Migration policing experiments such as boat turn-backs and offshore refugee processing have been criticised as unlawful and have been characterised as exceptional. Policing Undocumented Migrants explores the extraordinarily routine, powerful, and above all lawful practices engaged in policing status within state territory. This book reveals how the everyday violence of migration law is activated by making people ‘illegal’. It explains how undocumented migrants are marginalised through the broad discretion underpinning existing frameworks of legal responsibility for migration policing. Drawing on interviews with people with lived experience of undocumented status within Australia, perspectives from advocates, detailed analysis of legislation, case law and policy, this book provides an in-depth account of the experiences and legal regulation of undocumented migrants within Australia. 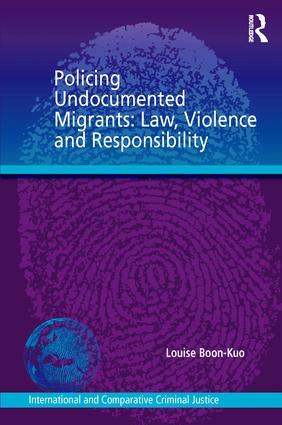 Case studies of street policing, immigration raids, transitions in legal status such as release from immigration detention, and character based visa determination challenge conventional binaries in migration analysis between the citizen and non-citizen and between lawful and unlawful status. By showing the organised and central role of discretionary legal authority in policing status, this book proposes a new perspective through which responsibility for migration legal practices can be better understood and evaluated. Policing Undocumented Migrants will be of interest to scholars and practitioners working in the areas of criminology, criminal law, immigration law and border studies. Louise Boon-Kuo is a Lecturer at the University of Sydney Law School. Louise researches in the areas of border policing, race and criminal justice.